A Small Act of Kindness! As we were hiking downhill and passing a small village in the Syangya district, Nicky (one of the 3 Sisters) and friends stopped by to have some tea. During this time, they saw an older lady suffering with a terrible leg infection. Immediately Nicky started to speak with the family and convinced them to bring the older lady to Pokhara. The lady was admitted to the hospital the same day and put under heavy antibiotics. According to the doctor if we had delayed to bring the lady she would have to lose her leg. After 14 days in the hospital, we are proud to inform you that the older lady is out of the hospital. 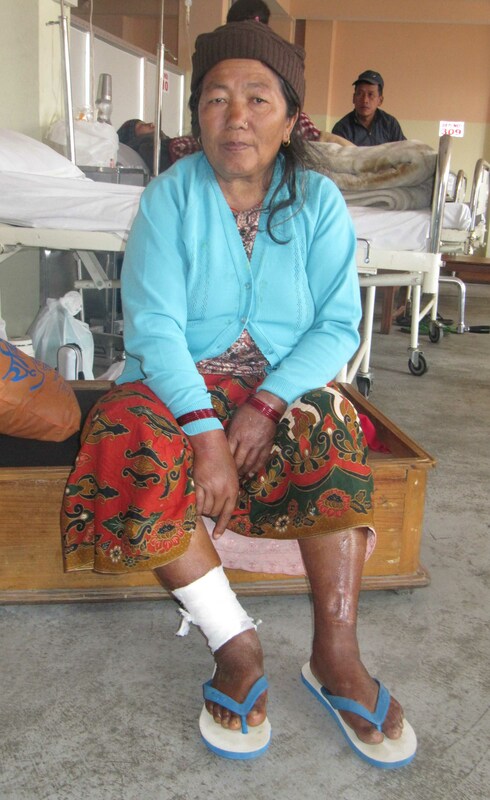 She is now resting in Pokhara and will be returning back to her village soon. A small effort of Nicky and friends helped save a woman from losing her leg, or even dying of infection. I understand that 3 Sisters Adventure also contributed significantly to pay for the medical costs of treating this lady. Sharon, Archana, Christine, Renuka, and Nicky. Mark from Amsterdam talks about Nagi Village Khopra Trek with 3 Sisters Adventure Trekking.